Children with Cancer > Stories > Get Involved Stories – Swim Fanatics triple their fundraising target! Swim Fanatics triple their fundraising target! Philip Young put together the Swim Fanatics team of adults and children – their aim was to swim between 500-2000 metres to raise £2,000 for Children with Cancer UK. Some swam up to 5,000 metres and Swim Fanatics ended up raising over £6,000! 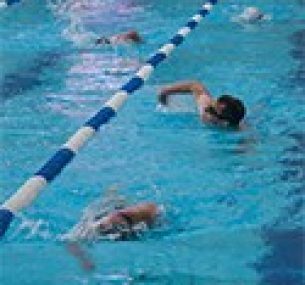 I had been developing my own swimming in my local club – doing longer and longer swims until I was able to swim about 4.5k. From this came the idea of organising a group swim for charity. I decided that a 2k swim would be within most people’s capabilities. It would take 2-3 hours to complete and would involve a few months’ training. I sent messages to friends about my plans, stressing it wasn’t a competitive event. Feedback was excellent and within few days the bulk of the team was in place. I then researched venues. The best facility I found for the event was not free – I really wanted to ensure that 100% of the funds raised would go to charity – so we decided to charge a modest entrance fee to cover about half of the cost of hiring the lanes, and my wife and I paid for the rest. We selected Children with Cancer UK as our charity knowing that it would appeal to a wide range of people. We called ourselves Swim Fanatics and set up our Virgin Money Giving page. The team began training. 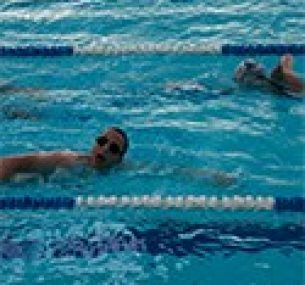 Quick progression is possible in swimming and they found they were able to regularly increase their distances. This helped team morale, attitude and confidence-building for the event. This confidence also encouraged them to put more effort into looking for sponsorship. After a slow start the £2000 target was looking possible after all! Leading up to the day team members were able to finalise their distances and give a rough idea of expected time. The children in the team would be swimming between 500-1,000 metres. I made final arrangements for the day, including confirming numbers at a nearby restaurant for a post-swim celebration. This was more important than it sounds as the swimmers would all be ravenous after the swim! The swimmers all made their choice of meal in advance so that the food would be ready when we walked in to the restaurant. That worked out well. Last minute pushes on the fundraising really paid off and we knew we had £6000 already before starting the swim – a great spur to us all. Everyone managed their distances – and more! On the day all went really well and everyone managed their distances and some even did more than they’d signed for, showing how much the event meant to them on the night. Our final total was much more than I’d hoped for and I’m really pleased with how generous people have been. I’m also extremely proud of every team member and would wish to say THANK YOU to each of them and their families and to the patient Lane Martials who did a great job on the night. It’s a great event to organise. Choose a sport with which you are familiar, that way you don’t have to worry too much about your own training, and you can concentrate on the organisation of the event. Start with modest plans until you know how interested people will be. It’s amazing how much people want to be involved and in our case we had put a cap on numbers because of all the interest! What’s next? Well, a few people on the night suggested that a bike event would be fun. Watch this space! Thank you Philip and the Swim Fanatics for all your efforts and fantastic fundraising.